The 4075 filter is a discrete, voltage controlled, 24/db/oct cascaded transconductance low-pass filter, employing six pairs of hand-matched transistors. In its lowest FREQUENCY setting it shaves off higher frequency harmonics; its RESONANCE or “Q” circuit pushes those harmonics past the self-oscillation boiling point, projecting a thumpy, thrashing squeal, with explosive low to mid-range power and depth. The design is actually pulled from the four-pole ARP 4072 (better: more parts and trims), sans the 12kHz design flaw which hamstrung the original’s high end. The 4075 name has stuck—no sense correcting our little misnomer misstep now. 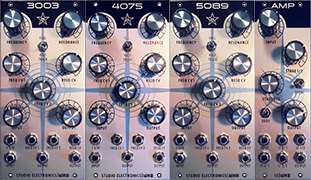 Our 4075 filter is the most requested of the Boomstar filter models, perhaps owing to its uniqueness. Has there ever been a better match for a square wave? It weaves dreams with “glidey,” 70s basslines, is a natural in the lead department, and feels as if a temper tantrum simmers a mere micron beneath its veneer of faux respectability. Aggressive and articulate, this fresh ARP can snap punishing kick drum sounds out as well as color with bright, edgy, stringy tones for essential arpeggiations. Three attenuverter and four attenuation pots control the FREQUENCY, RESONANCE, FREQ CV 1, RESO CV, FREQ CV 2, INPUT and OUTPUT, delivering smooth, detailed and complex expression. Classic Minimoog FULL and HALF strength filter frequency keyboard/voltage tracking for rounder low end with brilliant highs. 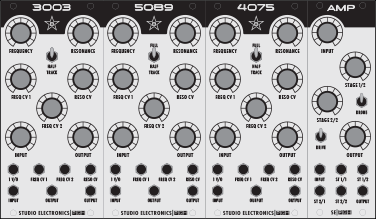 Seven patch points: 1 V/O, FREQ CV 1, FREQ CV 2, RESO CV, INPUT and 2x OUTPUT direct the deepest manipulation. FREQ CV 2 – Frequency control voltage 2 input attenuverter. FREQ CV 2 – Frequency control voltage 2 input. OUTPUT x2 – Audio outputs. * From 7:00 (0) to 9:00 our “Negative Resonance Saturation” adds beefiness, boosting the waveform amplitude and taming waveform transients; set to 9:00 to achieve the cleanest tone possible.